I admit I fell ill this weekend. I got a fever and the prescription was more cowbell..ahem I mean more Kate and Wills. I did not get up at 4 am Friday to watch with the rest of you nutso’s but I did spend my Friday night in front of the TV watching it. I had no kids after 8 pm (Ellie was asleep and Annie was at a party/sleepover) and since Mike was at work until late that night I popped some popcorn, put on my jammie’s and watched it all night long. First I watched a little on TLC but was getting sick of the commentary then I found the BBC version on our Public TV station here in Chicago and was hooked the rest of the night. Her dress!!! Wasn’t it gorgeous? Harry. Didn’t he look like he just rolled outta bed? The trees in Westminster Abbey! I loved how it made the church seem like a little city. The green trees with the red carpet and black and white floors? Loved, loved, loved every moment. My parents came up this weekend to see one of Annie’s game’s and to help celebrate my turning one year older! So much fun from watching the game together to going shopping at one of our fave little shops up the road. But when they are here, we always try to have a “Jewel Dinner”. One of our bigger grocery stores here is Jewel and they have the best Deli/Warm Foods sections with chicken, salads, soups, wings. It was so heavenly and there are leftovers so I will be eating them for days. So much fun and as always, so hard to say goodbye. It has been a little rainy around here. OK, a lot rainy around here. I do not know how you folks in the Northwest do it. After two weeks of it, I was staring out the window despondent. 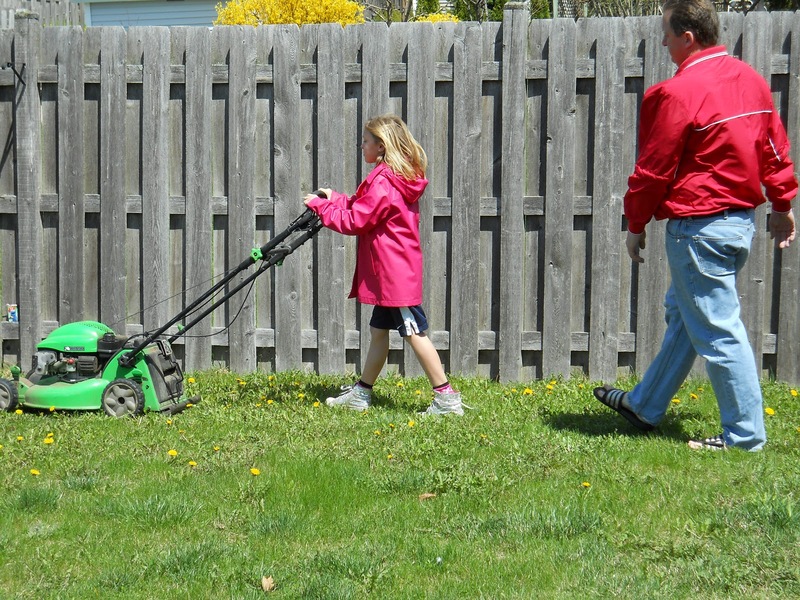 But it was gorgeous here yesterday and we took advantage of it; working in the yard, playing outside and went to our neighbor/dear friends/ baby sitter’s confirmation. A glorious day for many a reason but also a great introduction to May. Oh, and we have officially arrived; we now have a landscaper. I actually teared up a bit while watching this. I love this pic of Mike showing her “the ropes”. I have one like this of me and my dad from when I was this age. 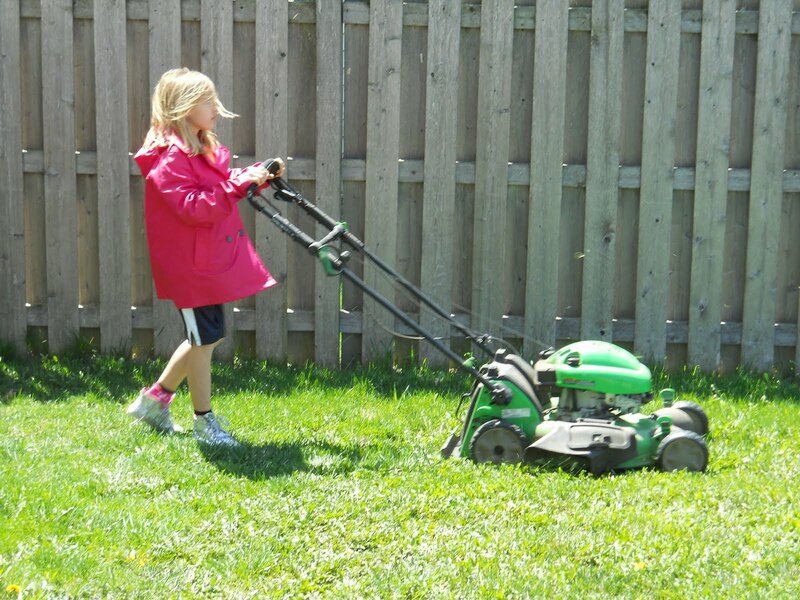 Our oldest has been begging to mow the lawn (shhh, don’t tell her it is a chore or she won’t wanna do it) for a year now and we told her this year she is ready. We will see how “excited” she is about this come next week. Yes, sweetie, it is a weekly job.